How To Get: Earn during The Revelry (Ends: May 07). Complete Triumphs and turn in Reveler’s Essence to Eva to earn a new Exotic Kinetic Fusion Rifle, Arbalest. It’s the first weapon of its kind and does extra damage against enemy shields. Do this by talking to Eva Levante at the Tower. She’ll give you a buff tonic and 50 Reveler’s Essence to spend on a buff of your choosing. Buff tonics give you a significant stat increase for use in the Verdant Forest and elsewhere. You’ll get to pick from a melee recharge buff, a grenade recharge buff, or a class ability recharge buff. Slot it in to get access to your first Verdant Garden bounty. Now, just finish a run of the Verdant Garden by queuing up from the Tower map screen, and return to Eva once the job is done. Each bounty rewards 25 Reveler’s Essence. Almost all of the bounties are easy to complete just from playing Verdant Garden (branches cleared, bosses killed, final hits, etc. ), so you won’t even need to mess with your preferred loadout. We cleared 25 branches and killed five bosses on my first run and I haven’t played much in a month, so expect to do just fine. If you stick to bounties, you’ll need to complete a total of 12, assuming you don’t spend any Reveler’s Essence elsewhere. That’s just over two days of finishing every daily bounty, but chances are you’ll find enough Reveler’s Essence to get the Arbalest in two days along the way. But you’ll likely need more time to get the Arbalest anyway. Just be sure to sit on 300 Reveler’s Essence to make it easier later on. But simply having enough Reveler’s Essence won’t cut it. You’ll need to earn the Party Hard triumph too, which requires completing 7 of the 10 Revelry triumphs. 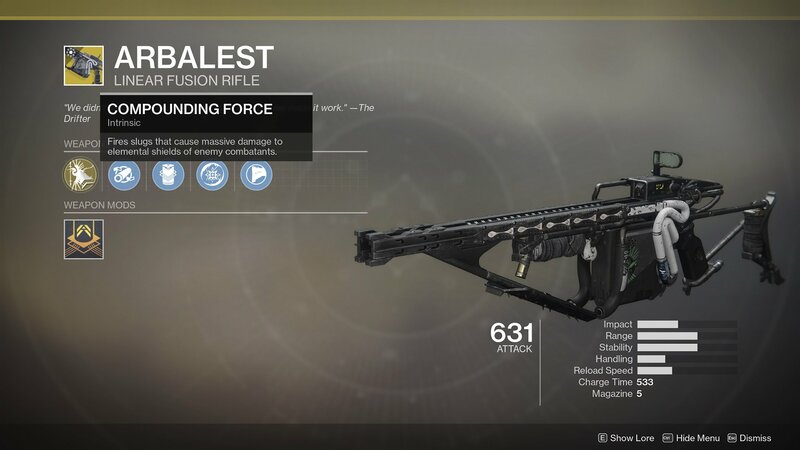 Hand over 300 Reveler’s Essence to Eva Levante (who’s located near Ikora Rey in the Tower social space), and the weapon is yours.